This is a story about my original character, Kit Johnson. Her and Ivygreane's character, Cyrus Riddle, embark on adventure's through romance and dangers in Hogwarts. Kieran was half-demon. Her only friend was a human who was dying from lung disease. She fell in love with him, shattering the most important demon taboo. Now, he's dying. She has the chance to save his life. But will she? This is A Hogwarts Story from the very beginning, from year 1, with Cyrus and Kit, back in the marauder era. This is all from Cyrus' POV. Here's how it all began. This was made for American Idol. I am sending this in for the Finals! I hope they will use my lyrics though! I made these originally in Spanish, but converted them to my English translation. Please respond! I'm kind of in love with Europe right now. It's amazing. I love those icons. xDD A few of them are inside jokes, and I'm sure you can guess which those are, but they're funny anyway. Hehehe. On DA I've got a different SN... I'm Curious-Kitten instead of silverfox. :3 I'll watch you first! Hehehe. I know! That was so funny! I was just like, "Oh, Snape, you little booger, you!" And then I kind of wanted to hug him, even though I'm not really a Snape fan. But I also wanted to hug him after Harry saw his memories. More so in the book, but in the movie too. Know what else I wanted to see? Madam Puddifoot's Tea Shop. I was SO looking forward to that. I wanted to see ghastly little cherubs throwing confetti everywhere. It would have been awesome. I know! There have to be some serious I-hate-you-even-though-I-want-to-marry-you-and-have-your-child-then-be-killed-by-the-most-evil-wizard-of-the-time vibes. Otherwise I will be severely disappointed. I did like the style in which they did Harry's memories, though. And how Snape inserted himself within them. Haha, yes, feel free to steal to your hearts desire! I got them off of various communities on LiveJournal... Because they have the best ones. 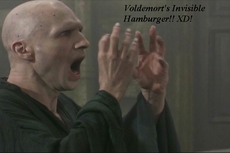 Speaking of icons, I love the Voldemort one you've got there. Did you make it? Yes yes yes! I've seen it twice already... My friend and I went and saw it at midnight the day it came out, it was so cool. And since the band Harry and the Potters was in town, we attended the show beforehand and then went to the same theatre as them. It was amazing. We (meaning everyone who had been at the show earlier, which was like two thirds of the theatre) sang the Hagrid song when Hagrid came on for the first time. :D Everyone else hated us. But am I the only one who thought they totally BS'd Snape's Worst Memory? My dad doesn't read the books, but when we got home from seeing it I made him read that chapter so he could have the greatest understanding of it. Yay! xD That's such a small batch of my icons. I have like a trillion. And I know, I love that art! It's so cute! YAY NEW BEST FRIENDS! xD Faving you!